Tiger Woods continued his remarkable return to competitive golf this weekend with a tie for a fifth-place finish at the Arnold Palmer Invitational at Bay Hill. This was Tiger’s fifth professional tournament this year, after competing in the Hero World Challenge in The Bahamas in early December 2017. While struggling out of the gate and missing the cut at the Genesis Open earlier this year, he has finished in the top-15 of the last three tournaments he’s participated in. Now that he looks back to form, the question is what Tiger Woods’ schedule will look like in the upcoming weeks. Tiger has yet to announce his plans for the next tournament he will play in, but it’s looking likely that it could be The Masters. He will not participate in the World Golf Championships-Dell Technologies Match Play from March 21st through March 25th, nor the Corales Puntacana Resort & Club Championship during the same time. The only remaining tournament prior to the 2018 Masters is the Houston Open, played on March 29th through April 1st. Tiger has never played the week leading into The Masters, so it’s unlikely he’ll change course this year. Therefore, pending an injury or some other unforeseen event, the next time you see Tiger Woods will be his return to Augusta National Golf Club for the first time since 2015. Given the excitement over his play during the past few weeks, fan demand for 2018 Masters tickets has reached peak heights. The average price for Masters badges for Thursday through Sunday is $2,681, the highest price since we began tracking the event in 2012. Currently, the average ticket price for a Masters grounds pass for Sunday is $1,830. That trails last year’s record price of $2,562, when Sergio Garcia took home the Green Jacket for the first time and tickets increased 71% during the week. However, if Tiger is in contention on Sunday, you can expect prices to skyrocket, even higher than the 71% increase that took place last year for Sergio. It’s fair to assume that this year’s Masters may have the most volatile ticket prices we’ve ever seen once the tournament begins. If Tiger struggles to stay in contention, or even misses the cut and doesn’t play during the weekend, ticket prices may plummet. If Tiger is on the top of the leaderboard, it wouldn’t be unreasonable to expect ticket prices to double over the weekend. The current rates available may be the lowest they ever get. Tiger last won The Masters in 2005 (his fourth Green Jacket) and finished in a tie for 17th when he last played in 2015. He hasn’t won a Major championship since 2008 (U.S. Open) and hasn’t won a tournament since 2013 (WGC-Bridgestone Invitational.) His presence during the past few tournaments has drawn massive crowds and you can expect many last minute Masters ticket purchases if he can remain in contention. 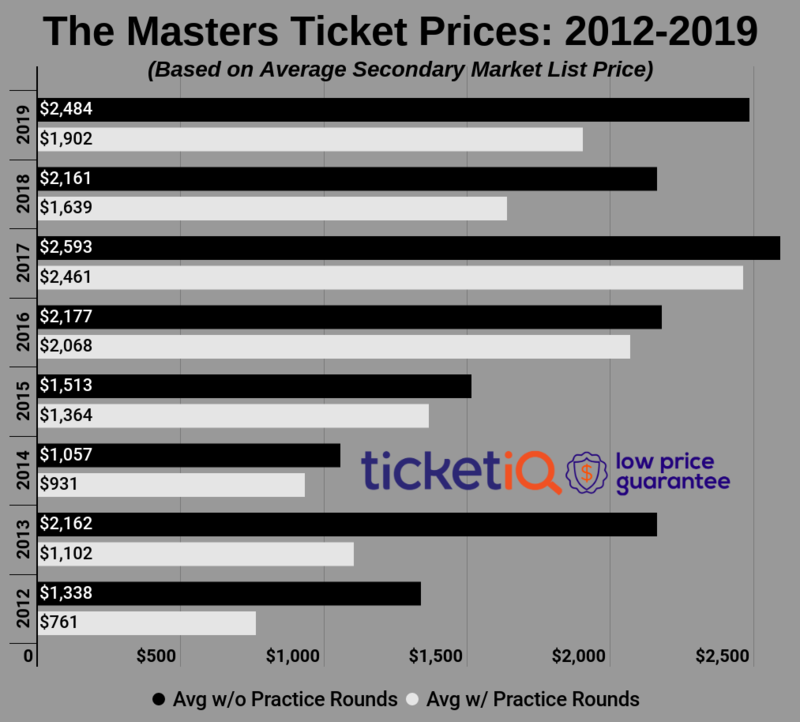 With a limited amount of Masters tickets available, we could see record prices that reach Super Bowl-esque levels very quickly.